The holiday season is here, which means people living in the apartments for rent in Glendale CA are decorating their homes with wreaths, trees, and more. 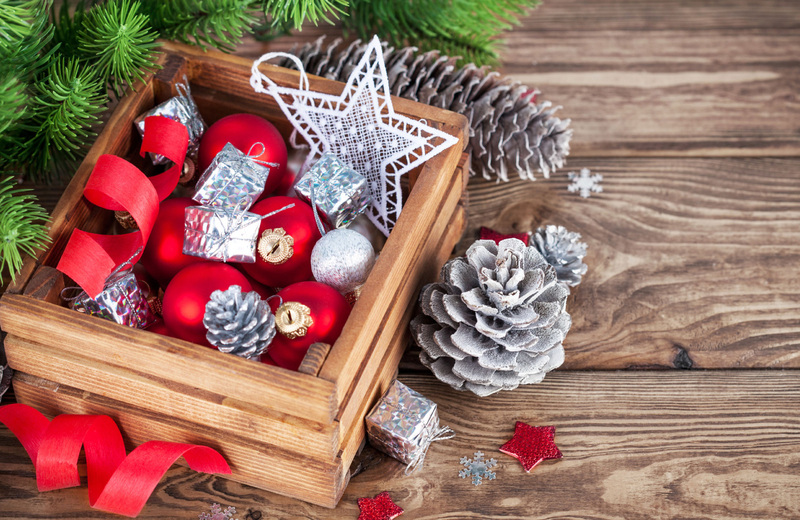 If you’re ready to deck the halls, then take a look at these 8 creative holiday decorating tips. The day may come when holiday decorations are as smart as our home devices, but this type of smart décor involves maximizing space without running into your cooking areas. Skip the kitchen counter altogether and keep things tidy by using your cabinets. You can tie ribbon around small wreaths or other decorations, then hang them from the back of your cabinets. It’s an excellent way to decorate the entire kitchen without losing an inch of space. When creating that magical holiday feeling, start from the top and work your way down. Imagine walking through a hallway with cardstock snowflakes or twinkle lighting hanging above. Magical, right? Best of all, these lightweight options allow you to simply tape decorations in place instead of making holes in your ceiling. The more you can fit up top, the more space you save. People often make the mistake of placing an enormous centerpiece on their tables or counters. While it may look nice, you can achieve the look of grandeur with much smaller designs. Take a small mason jar, then fill it three-quarters of the way with spruce or pine. Add a layer of cranberries on top, then fill the jar with water until it reaches the halfway point of your cranberry layer. Place a tealight candle in the center, and you have a luxurious looking decoration that delivers the warmth of the holidays. Your home at Altana incorporates an elegant color scheme designed to bring out the glow of proper lighting and help colors pop. Both red and green work with each apartment’s pallet, allowing you to create unique holiday pieces throughout your living space. By focusing on small, individual spaces within your home, you can create eye-catching décor that encompasses you in the holiday spirit. As for lighting, the pallet in your home blends with the warmth of holiday lighting like candy cane and mocha cappuccino. Incorporate lighting wherever and whenever you can. If you’re unsure of where to start, begin by placing lights around the windows, under the lip of the counter, and around the entryways to other rooms. While it is possible to place a tree in your home at Altana, the amount of effort is more than cumbersome. Plus, a tree takes up valuable space that yourself and guests could otherwise enjoy. Thankfully, there are plenty of festive alternatives. For the DIYer, give your home a splash of green by painting pinecones. Place them in tiny plant pots, top them with a shimmering star, and you can have tiny holiday trees all over your apartment. Craft-oriented individuals can also create a shelving unit in the corner. Simple hang a series of shelves that grow longer as they reach toward the floor, then decorate them however you would like. If craftiness isn’t in your skillset, you can always decorate the wall. Trendy apartment dwellers either paint a tree or place green paper in the shape of a tree on their wall. Finishing the look is as simple as taping sting lights onto the wall for a magical, glowing appeal. Finally, there’s the “Charlie Brown.” A single pine branch decorated with tiny ornaments can work wonders in apartment spaces. By placing in it a red vase, you can incorporate both traditional holiday colors at once. Sight is only half the appeal of the holidays. Scent is equally as important, but you don’t have to shell out an exorbitant amount of money on top-quality candles. In sticking with the holiday spirit, this trendy homemade solution will leave your home smelling better and feeling warmer. Simply boil cranberries, cinnamon, orange slices and pine on the stovetop. ](https://www.scratchmommy.com/diy-holiday-potpourri/)The end result is a [spectacular smelling potpourri. One of the easiest decorating changes to make is swapping your usual décor out for holiday-themed items. Thanks to the spacious closets at Altana, storage isn’t a problem in your apartment. Throw pillows, blankets, and table toppers are excellent places to start. There are plenty of ways to incorporate stockings into your holiday decorating. The first is to simply string them up on the wall, using clothespins to hold them in place. If you want a classier look, consider using a rustic-looking curtain rod. You can easily hang this off of any shelf in your home, then connect the stocking via a fabric loop. Given the various curtain rod designs on the market, you can really make this decoration your own while working with the space you have. Altana is a brand-new community of apartment residences enriched with resort-style amenities and nestled on an acre of private, open space. These homes provide the perfect waypoint between work, play, and rejuvenation. Residents can relax after a long day on the lounge decks, Zen garden, and expansive rooftop pools. Entertain your guests by the outdoor fireplaces, enjoy a film in the screening room, or satisfy their appetites in the demonstration kitchens. Take care of today’s business dealing in the Wi-Fi enabled co-work space. Everything you need is just outside your door. Each home within Altana features the finest in modern finishes. Natural wood flooring leads to oversized windows for ample amounts of natural lighting, recessed LED lighting accentuates beautiful quartz countertops, and modern Italian cabinetry compliments stainless steel appliances. Private outdoor areas and nine-foot ceilings create grandeur, while a stacked washer and dryer eliminates the tedium of community laundry. Each spacious floor plan provides the comforts of home while elevating your sense of living. We invite you to experience life in Glendale in an entirely new light, one wrapped in luxury and bathed in comfort. Welcome to your respite from everyday life. Welcome to Altana.